Have you ever seen this message on your Android phone? I have been an avid user of Android since the very first Android Google Phone; the T-Mobile G1. I am now using the T-Mobile G2 which is really a HTC Desire Z and I love it. Now I have my eyes set on the G2x. I have never really experienced any problems with my phones until the other day. The market would show I have several updates that needed to be installed. I’d click the “Update All” icon and wait for them all to download. This is where I started noticing a problem. All the installations were for some reason unsuccessful. 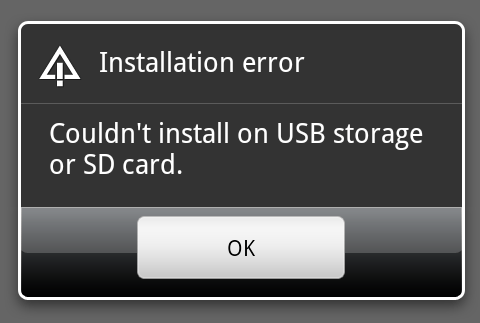 After clicking on the Installation was unsuccessful notification I would get an error message similar to the one here that said “Installation Error: Couldn’t install on USB storage or SD Card.” As you can imagine this to be super frustrating. What’s this? An Angry Birds update? Awesome! WHAT?!?! NOOOO! It’s not updating! I tried several basic troubleshooting steps like powering down the phone and powering it back on, mounting and unmounting the SD card, pulling the battery and SD card and replacing; nothing. Here is a simple tutorial on how to fix the problem without losing any of your data. Although you will not lose your data it is always good practice to back it up before tampering with it. Please follow these instructions to get rid of this annoying Android caused Error Message. As far as I am aware all Android phones are prone to this message at one point or another. The problem appears to stem from a corrupt app installation and the temporary/cache file needs to be cleared. Plug the phone into your computer via USB cable. Tap the “Turn on USB Storage” on your device. Copy the contents of your SD Card / “Removable Disk” to a safe place on your computer. *If you do not have a current backup of your data. Find and Open the .android_secure folder on your Android’s SD Card. Find the file named smdl2tmp1.asec and rename it to smdl2tmp1.asec_backup. Tap the “Turn off USB Storage” button on your phone. Unplug your phone, power it off, and power it back on. This method will fix the error message and get you using the latest Android Market apps and games. Please let us know how this method works for you!